Yeah another Quant mystery! Thanks Nada! Plowed through this book and really enjoyed it. I just wish Russell was nicer to his mama! I am taking this book to our monthly bookcrossers meet up at Cravings - the second Saturday of every month- to pass on to the next reader. Picked this up at the May meet-up of Calgary BookCrossers at Cravings Market Restaurant. 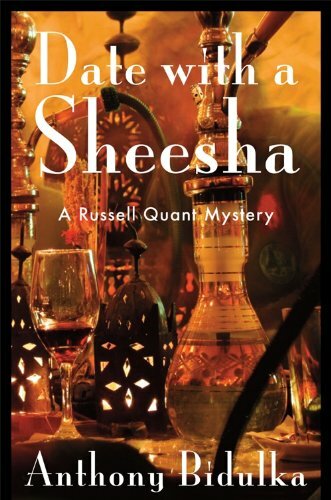 As with all of the Russell Quant series, I totally enjoyed this book. I was a bit saddened at the conclusion and I know the end of the series is near. What a wonderful Canadian author and authentic character. Thank you for sharing this great story with the Book Crossers! Released at the June meet-up of Calgary BookCrossers, held at Cravings Market Restaurant. Brought this back from the June BC meeting. Yay R. Quant! Interesting setting! He is such a character. But the end!!! This leaves me worried like the Maisie Dobbs series. Will there be more???? Time to pass this on to the next reader at the August meeting at Cravings! I missed the last meeting so my mom brought this one home for me. Can't wait to read it. Another excellent Russel Quant novel. I enjoyed reading about Russel's travels and once again got the murderer wrong... always nice to be surprised! Are you in the Calgary area and interested in meeting up with other Calgary BookCrossers? Please check out our facebook group, "BookCrossing Calgary" for details on how. Meeting are held on the second Saturday of every month starting at 11am. Location is unknown, please PM me for information. New Crossers are always welcome. Taking this to November's meeting. Picked up at the November meeting. Taking to the April meet up for the "Trial and Error" theme! Calgary has an active group of BookCrossers that meet to swap books and discuss book crossing every second Saturday of the month at 11am at Cravings Market on Fairmount Drive SE. We always love to meet new crossers, so please join us any time you like! Passing on this book to the next reader at the Calgary BookCrossing May meet-up. Brought this home from the May meat up at Cravings to pass on to one of our members. Enjoyed this book as with all the others. Thought I had figured out who dun it but was wrong. Hope Russell finds his happy ending in book eight. Taking this to the August BookCrossing meeting to be enjoyed by the next reader. I really enjoyed the carpet tie-in and the mystery which took place in the middle east, and the hunt for a mythical carpet! It has never been an area on my sight-seeing tourist radar too much, but this put some things on my list. Again the mystery took a darker turn than I was expecting - which lead to a change in his personal life which I was expecting. Not sure what to expect in the next and final book, but looking forward to find out! Picked up this one at the July Calgary BookCrossing meetup.